Buttercream One Tier Wonders Book is a stunning collection of cake decorating projects will transform your regular bakes into works of art, using simple techniques and nothing but 100% delicious buttercream. With 30 step-by-step single-tier cake decorating projects on a wide variety of themes, you’ll find cakes for all occasions that will lift your baking to a new creative level. The cakes range in size from 4 to 8 inches high, and come in a host of shapes and sizes – round and square but also simple carved shapes including a wreath, a log and a birdcage. The ideal book for buttercream beginners, this colourful cake decorating book will show you how to create simple yet sensational cakes every day that will wow all who see and eat them! With expert instruction from the best buttercream teachers in the world, you’ll learn step-by-step a wide range of innovative buttercream techniques using piping tips, palette knives and more. 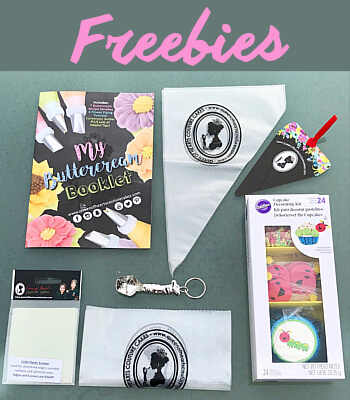 FREE Bookmark, bendy scraper, cupcake keyring, Buttercream Booklet (variety of buttercream recipes and flower piping tutorials) and a Wilton surprise gift on any book purchase! UK shipping only. For all international orders, we highly suggest to check your go-to online bookstores like Amazon, Book Depository, etc.